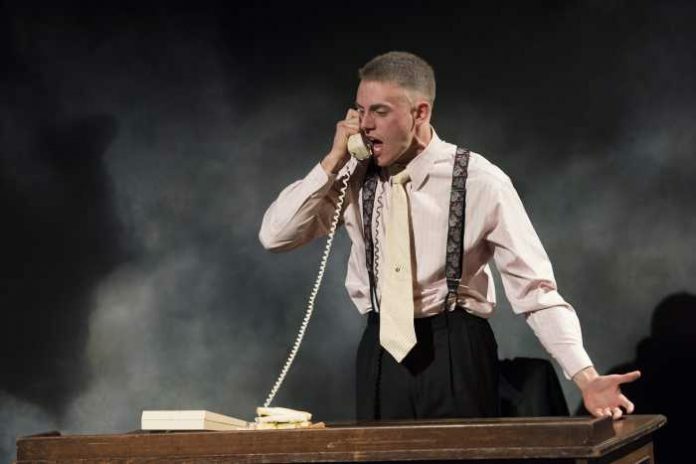 Conor Stinson O’Gorman as Roy M. Cohn in the Studio 58 production of Angels in America. Photo by David Cooper. Tony Kushner’s epic Angels in America: Millennium Approaches comes to life with some equally epic performances from the students of Studio 58, Vancouver’s professional theatre school at Langara College. More than a history lesson, or even as we pry the relevance to suit 2016, first and foremost, Angels in America is a brilliantly written play. While it may be a product of its era, it easily transcends its place in history. Like any truly great work of art, it has risen to the status of being timeless. The first of two 25th anniversary productions in Vancouver this season, Kushner’s complex and layered treatise on the AIDS crisis of the 1980s still resonates. What might be surprising though is the play’s resonance doesn’t come from its historical view into the ravages of AIDS. Rather, its biggest strengths today are in its unflinching views on politics, greed, and religion. With it comes an unexpected mix of optimism and longing that feels very much like today’s world. More than a history lesson though, or even as we pry the relevance to suit 2016, first and foremost, Angels in America is a brilliantly written play. While it may be a product of its era, it easily transcends its place in history. Like any truly great work of art, it has risen to the status of being timeless. While some talk of Angels in America as a play of ideas, or even ideals, for it to work effectively it must first have characters that we can believe. Under Rachel Peake’s direction, this young cast mines every bit of their character’s eccentricities and emotional depth. And even while it is not always easy to look beyond the casting of some of these young actors in roles beyond their years, it is an obvious necessity. Leading the way is an absolutely spot-on performance by Conor Stinson O’Gorman as Roy M Cohn, the closeted gay lawyer who would eventually die of complications from AIDS. Based on the real-life Cohn, one of Joseph McCarthy’s linchpins during the Senator’s crusade against communism in the 1950s, there is a certain irony in 2016 that he also served as Donald Trump’s lawyer and confidant. There is an intensity and underlying grasp to the complexity of Cohn in O’Gorman’s performance that is at times breathtaking. With Al Pacino’s award-winning performance as Cohn in the impressive 2003 HBO mini-series as the benchmark, O’Gorman owns this role. Even as an actor many times younger than both Cohn and Pacino, there is a maturity that belies his age. Intensity seems to be the catchphrase for this production, as Julien Galipeau explores Prior Walter’s journey towards death with excruciating clarity. Resignation gives way to fear, which gives way to exultation, in a performance that is as layered as the play itself. Julien Galipeau as Prior Walter. Photo by David Cooper. Elizabeth Barrett brings the pill-popping Harper to life with a delightful blend of pathos and confusion, while Scott McGowan and Braiden Houle bring the needed levity as the prior Priors. Not an easy play given the play’s mix of magic realism, humour, and drama, Angels in America is also coupled with a healthy dose of metaphor and symbolism. Under the direction of Rachel Peake there is a clarity to this production, which becomes increasingly important with Kushner’s numerous intersecting plot lines. To call Kushner’s play complex is an understatement, but its intricacies extend beyond the text. With a running time of three hours, the imperative here is to keep the action moving. Director Rachel Peake accomplishes that essential requirement through Drew Facey’s set design. Primarily made up of two moveable curved walls that glide effortlessly, the configurations become endless, and the transitions fast and flawless. Peake even incorporates the stage hands required to move the walls who move about the stage with almost dance-like and otherworldly flourishes. Split into two parts – Millennium Approaches and Perestroika – it is part one of Kushner’s story that we see here. While the first can be viewed in isolation, by the end of this production’s third hour one may very well wish that Perestroika would also be performed. For those that want to continue on Kushner’s epic adventure, I recommend seeking out the HBO mini-series. After seeing how the first half, at least, was meant to be seen: on stage. This production sets the bar high for the second presentation of Millennium Approaches next spring in Vancouver. With inevitable comparisons, the production set for March is now under a lot more pressure to deliver. Angels in America Part One: Millennium Approaches by Tony Kushner. Directed by Rachel Peake. A Studio 58 Langara College production. On stage at Studio 58 (100 West 49th Ave, Vancouver) until October 16. Visit http://studio58.ca for tickets and information.